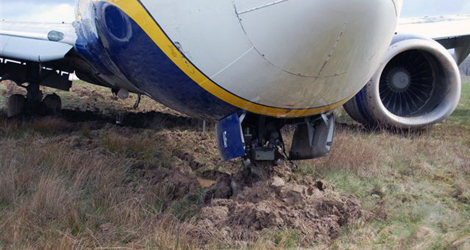 The Ryanair flight FR772 made a normal landing on Runway 31 at Prestwick Airport. 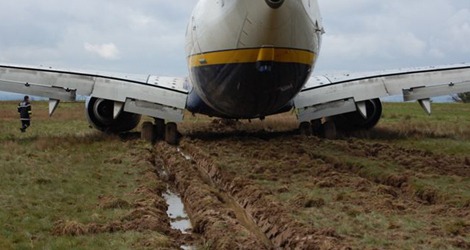 As the turnoff at the end of the runway approached, the brakes were applied, with no apparent effect, and Ryanair flight FR772 slid off the end of the runway onto the grass. There was no reported damage to the aircraft and there were no injuries to its occupants. Braking was still ineffective, so, with the end of the runway approaching, the commander attempted to turn the aircraft 90° to the left, onto the taxiway, to avoid a runway excursion. The nose of the aircraft slewed 45° to the left but the wheels continued to track along the runway and the aircraft slid off the paved surface onto the grass at a groundspeed of 24 kt. Recorded data indicated that the second application of braking started at 0847:24 hrs, at a groundspeed of 42 kt, using gentle pressure at first, increasing to the maximum. The aircraft left the paved surface thirty seconds later at 0847:54 hrs and travelled a further 20 m, before coming to a stop with the wheels having sunk into the grass. The passengers and crew vacated the aircraft via the forward airstairs onto the grass and moved across to the surface of the taxiway and runway. Several people commented afterwards that the paved area was very slippery to stand on. Photographs of the runway and taxiway, which were taken at the time, appeared to show a glazed reflective surface, suggesting the presence of ice. There was no evidence of any technical problem with the braking systems of the aircraft. The crew of Ryanair flight FR772 were both familiar with Prestwick Airport. After landing, they would normally have expected to vacate the runaway via the rapid exit onto Taxiway K. On this occasion, ATC advised the crew prior to landing that K was not available and that they would have to vacate at the end of the runway. 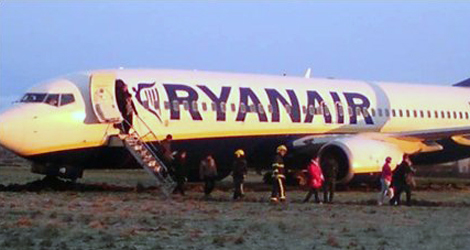 The co-pilot of Ryanair flight FR772 listened to the ATIS but did not pass on the exact detail of the ‘EXTREMELY ICY’ taxiways and apron. Perhaps because of this, there was no apparent discussion between the crew about the surface conditions and the potential problems with operating on a slippery surface. A de-icing run was carried out on the runway but at an application rate only suitable for anti-icing. Therefore, it is likely to have been of limited effectiveness. 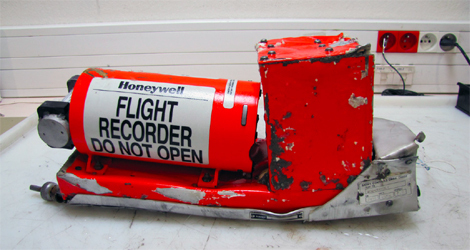 It was not possible to tell from the recorded data whether the aircraft maintained the centreline of the runway throughout the landing roll but it seems unlikely that it was outside the 30 m treated strip. 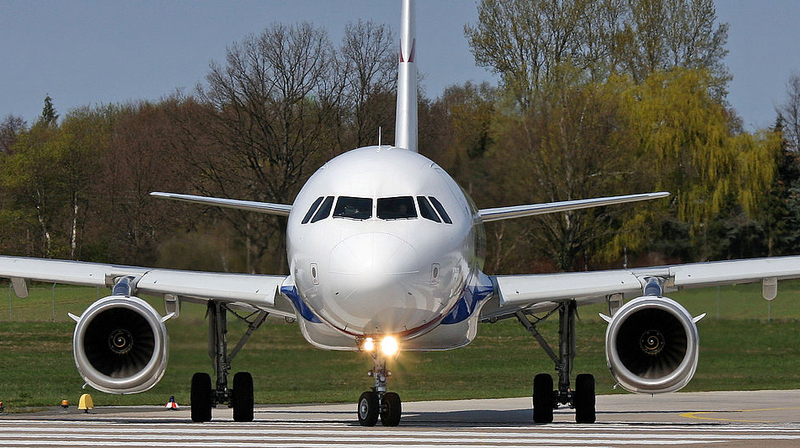 The loss of braking effectiveness appears to have started at the onset of the second application of the brakes and, despite the commander having applied up to maximum brake pressure, continued until the aircraft left the paved surface. There was, therefore, a period of 30 seconds where the brakes of Ryanair flight FR772 were applied but were not appreciably slowing the aircraft. This suggests that the runway surface was slippery between K and J, at least in some areas, as the result of ice. There was no attempt to re-deploy reverse thrust, probably because it is an unusual action once cancelled. It could, however, have had some beneficial effect, although it does take a few seconds for engines at idle power to spool up.